U.S. Marine Corps Air Station activated 1941 as Cunningham Field for first USMC aviator A.A. Cunningham. MCAS Cherry Point since May 1942. During the summer of 1940 the Marine Corps conducted a search along the U.S. East Coast for a suitable site for an air station. The search brought them to an area in Craven County on the Neuse River between Hancock and Slocumb Creeks. There they created, in a matter of months, a self-contained city of 20,000. Rep. Graham Barden was the project's leading advocate in the Congress, which appropriated forty million dollars in 1941 for construction purposes. 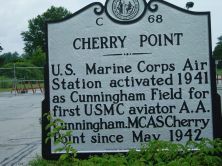 On September 4, 1941, the facility was designated “Cunningham Field at Cherry Point, North Carolina,” in honor of Lt. Col. Alfred A. Cunningham, the first Marine officer to become an aviator. Through condemnation proceedings, the government acquired 7,582 acres and construction commenced on landing field runways. On March 18, 1942, Lt. Col. Thomas J. Cushman initiated flight operations with the landing of a Grumman J2F “Duck” amphibian. On May 20, 1942, at an unembellished flag raising ceremony, the Marine Corps Air Station Cherry Point was officially commissioned. The name referred to a point of land extending into the Neuse River. Although the Cunningham Field name was no longer used, the aviator pioneer’s memory is preserved through the name of a boulevard on the base. 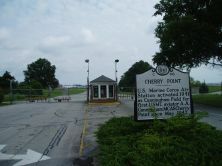 Marine Air Corps Station Cherry Point grew rapidly to become the largest Marine airfield in the world. It was the home of the 3rd and 9th Marine Aircraft Wings during World War II and has been the home of the 2nd Marine Aircraft Wing since 1946. Troops from Cherry Point have taken part in every major military engagement since 1941: World War II, Cuban Missile Crisis, Dominican Republic, Vietnam, Lebanon, Grenada, Panama, Desert Storm, and the War with Iraq.